I pause in a small cafe near Dores, a village overlooking Loch Ness. A coffee in my hand, I follow the words of an elderly man sitting opposite a couple dressed in grey Parkas. 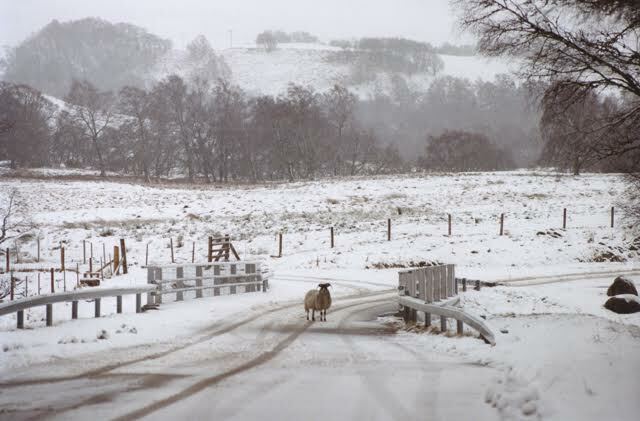 About eight years ago, he says and strokes his beard and lips, a farmer led his flock of sheep along the grassy slopes near the loch, returned to his farm and registered that one had gone missing. He wandered the trail, he asked neighbors to keep out an eye, without success. Eventually, weeks passed, a fisherman discovered the sheep, grazing at a small bank underneath a cliff confined by greenery. This beach, as many around the loch, was not accessible from the land. Unnoticed, the sheep must have fallen over the cliff into shallow waters and succeeded to crawl to shore unharmed. The farmer, cheerful about the news, tried to rescue the animal with the support of the fisherman. Yet the sheep´s resistance to depart from its new terrain led to a bad leg injury of the farmer. Exiting the hospital a week later he decided to abandon the sheep underneath the cliff. Over the years, villagers have reported of the solitary animal; its fleece had grown to almost twice the size of the entire animal. Two winters ago it was seen last. At the time the creature dragged a large fur behind itself, a brown aggregation of mud, hair and dried leaves. It resembled a large moss-covered rock, standing isolated in the centre of the sandy flat. The elderly man leans backwards. It is snowing. I get up, leave the cafe and get into the car to head towards Fort Augustus. On my way, the snow hits the wind screen, the wipers toil in silence. The car drifts along the loch, through woodlands, over fields. To my right, the pasty water curls and frills.